Companies affected by the art school and Victoria's nightclub blazes will be supported. 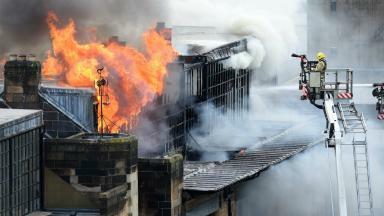 Almost £2m is being used to give business rate relief for companies affected by the fires at the Glasgow School of Art Mackintosh building and Victoria's Nightclub. The Scottish Government has announced approximately £1.85m of its Fire Recovery Fund will be used by Glasgow City Council to provide business rates relief and support recovery efforts following the fire in June. Some 200 businesses in the eligible area have already received more than £3m from the £5m fund, which was announced by Economy Secretary Derek Mackay in July. Mr Mackay said: "Having already provided a great deal of assistance so far, the Scottish Government is now making the remaining balance of its Fire Recovery Fund - some £1.85m - available to Glasgow City for further business rates relief. "This relief will provide much-needed breathing space while businesses resume trade and allow them to focus on the commercial opportunities of the festive period in the knowledge that they will not face any additional business rates liabilities related to the period between January to March. "The devastating fires at the Glasgow School of Art and near Victoria's Nightclub have had a significant and lasting impact on businesses, residents and the Sauchiehall Street economy alike. "The recovery fund has given financial relief for hundreds of eligible businesses and, while the immediate disruption has passed, it is clear the effects will continue to be felt for some time. "Businesses are the lifeblood of Sauchiehall Street and stability continues to be their overriding priority." "The council has been an invaluable partner and we will continue to work together closely to ensure the needs of the businesses most impacted are met." Glasgow City Council leader Susan Aitken said: "The Sauchiehall Street fires had a huge impact on the city, most especially on those who live and work in the vicinity. "In response to these tragic and traumatising events, and in partnership with the Scottish Government, we ensured local businesses received the support needed at a crucial time. "Businesses are the lifeblood of Sauchiehall Street and stability continues to be their overriding priority. "There has been a real acceleration in the physical improvements in the area and this announcement will complement and make a significant contribution to our aims and ambitions for a 21st century Sauchiehall Street."